Break the Silence: Yes to Peace! 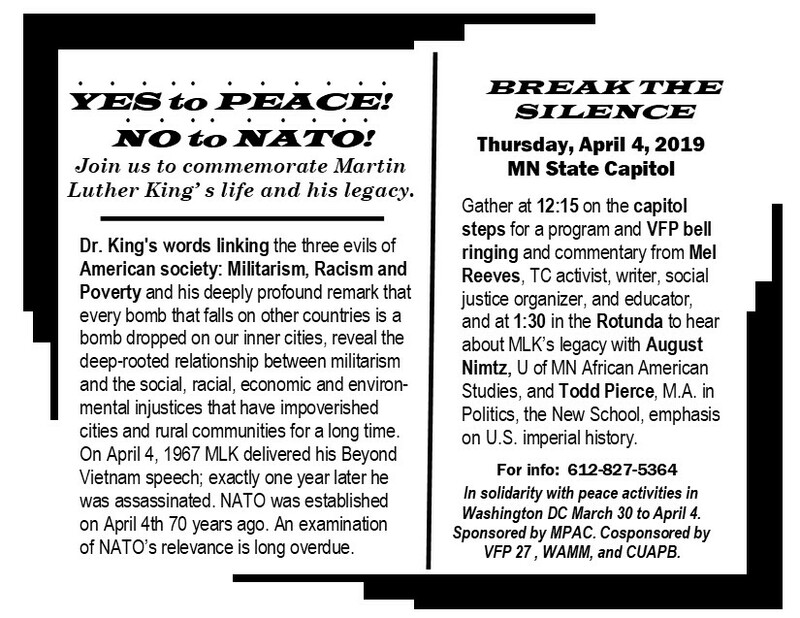 No to NATO, A commemoration of the life and legacy of Martin Luther King, Jr. Gather at 12:15 on the capitol steps for a program and VFP bell ringing and commentary from Mel Reeves, TC activist, writer, social justice organizer, and educator, and at 1:30 in the Rotunda to hear about MLK’s legacy with August Nimtz, U of MN African American Studies, and Todd Pierce, M.A. in Politics, the New School, emphasis on U.S. imperial history. Dr. King's words linking the three evils of American society: Militarism, Racism and Poverty and his deeply profound remark that every bomb that falls on other countries is a bomb dropped on our inner cities, reveal the deep-rooted relationship between militarism and the social, racial, economic and environmental injustices that have impoverished cities and rural communities for a long time. On April 4, 1967 MLK delivered his Beyond Vietnam speech; exactly one year later he was assassinated. NATO was established on April 4th 70 years ago. An examination of NATO’s relevance is long overdue.